The Shell Mastercard has gone through several changes in their gas rebate formula. In the old days, they paid a straight 5% cah back for purchases of Shell gasoline (diesel and aviation fuel do not count) and 1% on everything other purchases. Then sometime in 2009, they reduced the rebates they paid on "non-shell purchases" to 0.5% from 1%. Right now, cardholders get a discount on the number of gallons of Shell gasoline that they buy. And it is based on the amount of money that they spent. Here is the table showing the formula. As you can see from the table above, you need to spend at least $500 in qualifying purchases (defined by Shell as purchase you make on the card for personal, family and household purposes) every month to get a discount off your gasoline purchases at their stations. If you spend between $500 and $999.99 on the card, you get $0.10 discount per gallon. Spend between $1,000 and $2,499.99 and you'll get $0.15 per gallon discount. Spend $2,500 or more a month and you'll get $0.20 discount per gallon. What is the discount worth in percentage terms? - They key question is how does the new discount per gallon formula compare with the old 5% cash back that you get? And the answer varies depending on the price of gasoline. And we have to do a little break even analysis. As you can see from the table, under certain circumstances, you can earn 5% cash back or more on Shell gasoline. Your best bet would be to spend at least $2,500 a month on the card and get the 20 cent discount per gallon. That way, you will be at least getting close to 5% (or exceeding it) rebates based on where gasoline prices are at today. Right now with gas prices hovering between $3.50 and $3.75, you will be close to earning 5% if you are eligible for that rate. And if you are, then you should be indifferent between the old formula and the present one (for now anyway). Limitations - Under the old 5% formula, you were limited to earning $20 in rebates each month, which means up to $400 in Shell gasoline spending. However, with the current set up, there is no limits as to how much rebates you can earn a month. Instead, the discounts that you get are capped to 100 gallons of purchases a month. Comparing gas cards has become a more complicated exercise because each station has got several cards (so you have to compare them within the same family). You also have to compare them with other station specific cards. Then, there are also cash back cards that give rebates on gasoline expenditure. In the consumer segment, Shell also has the Drive By Five card. It is not a Visa or a MasterCard but a store card, which allows you to get 5 cents discount per gallon when you make Shell gasoline purchases. So in the Shell family, this is clearly the better card. There are also other major gas cards that have very similar formulas to this one. For example, the Marathon Visa allows you to get $0.25 discount per gallon if you spend over $1,000. If you spend between $500 and $999, you will get $0.15 per gallon discount for Marathon gas purchases. And if you spend less than $500, you will get $0.05 per gallon discount. Hence, in this particular example, the Marathon Visa is actually the slightly better card than this one. Another interesting example is the BP Visa. When you spend $100 at BP stations, you will get $0.15 discount per gallon. If you spend $100 on "other regular purchases", you will get $0.05 discount per gallon. The Chevron card provides another interesting comparison. 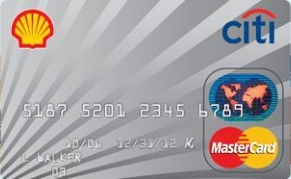 Once you spend $300 a month on that card, you can get $0.10 discount (per gallon). Spend $1,000 or more and you can get a $0.20 per gallon discount at Chevron. As you can see from the above examples, the Shell MasterCard is pretty competitive with it's gas station peers. There may be cards like the Marathon Visa that has a slightly better reward system. But that will matter little if you use Shell as your sole gas station. There are other cards like the Blue Cash Everyday and the Costco Card that pays 2% and 3% respectively on gasoline spending on most gas stations (except those belonging to groceries like Kroger, BJ's etc). But depending on your spending level and gasoline prices, you can earn more than this if you use this card at Shell stations. If you use Shell station exclusively and spending at least $2,500 a month on the card, then (at current gas prices) this is actually a great card for earning cash back and rebates on Shell gas purchases. If you use a few other gas stations, then you might just to consider getting a cash back card with gas rewards. Though you will probably earn less in terms of rebates on gas purchases, you will probably earn more cash back from gas spending this way since these cards pay you cash back for gas purchases at any stations.